When I first started thinking about writing this post about joy, I kept thinking about my sisters and all the joy they bring me … well most of the time! I kept trying to think of something that wasn’t so sappy, but realized that my sisters do bring me lots of joy! We manage to have silly quilting fun almost everyday! There are 5 of us sisters total and 4 of us actually quilt! We keep hoping that the 5th will start quilting someday, but for now she just takes what she wants from the other 4 so there is no incentive to learn. We actually ended up making 6 quilts total. One for each sister and one for my mother and father. Mary had a tribute to an old family recipe printed for the labels. It’s dedicated an old Polish recipe handed down from my grandparents for stuffed cabbage. My dad is no longer with us so this label is extra joyful with all our signatures! Although we 5 sisters are really close, quilting helps keep us together. Mary and I are fortunate to travel for our jobs and have taken the “sisters” along on some of our quilting adventures, like a Caribbean Quilting Cruise with our Mom. This is our sister Terry on one of the 4 wheeling cruise excursions showing off the bugs in her teeth! She’s the sister between Mary and I in age. Lets not forget the locals right here in the good old USA! I get to work and have fun with my sister everyday because of our quilting bond. I have many friends because of quilting too and that brings me JOY! A Joyful and Merry Christmas to all of you!! 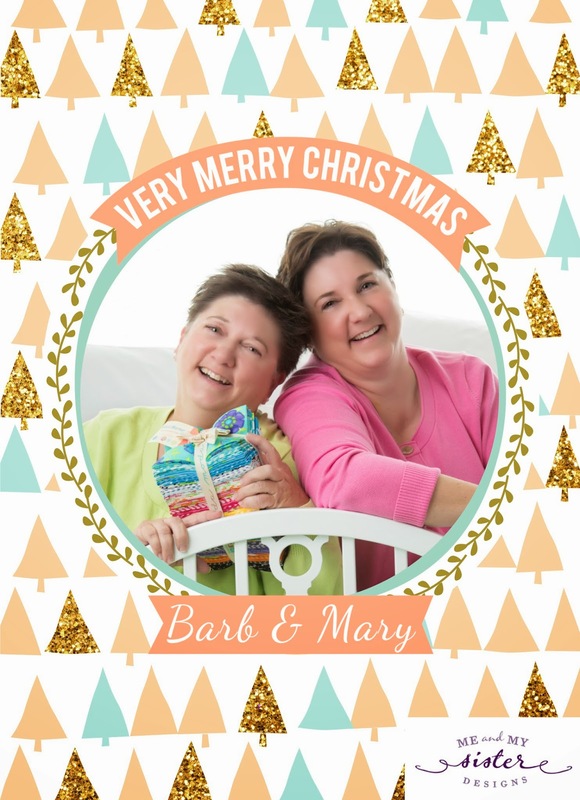 By Guest BloggerIn UncategorizedTagged Joy, Me and My Sister Designs, Share the Joy8 Comments on Quilting Joy! Awww! I have 4 sisters too! I’m the only quilter..now I have some incentive to get the rest of them going! lol! I’m Polish and make golumpki too! Met the two of you recently in Portland! Thanks for sharing. Luckkeee!! My sister, Pam Cope of Kitten Britches blog, is my best friend and fellow quilter. We love to collaborate on quilts though we live far apart. Our dream is to live together, we just can’t figure out what to do with our husbands. Neither wants to move. Look forward to meeting you at a fun Quilt Event. What a fun post! Merry Christmas to you! Sisters (and brothers) are wonderful. How wonderful! I have 5 sisters and 3 brothers; it’s always a riot when we get together. Our children have also learned the value of keeping in touch with family. I am the only quilter in the family; hence, I get very busy making everyone in the family quilts. My nephews and nieces are now graduating from college and are asking for bed-size quilts. It makes me so happy to see how much they love their quilts when I give them one. The last one I made and gave away just this past Thanksgiving was a T-shirt quilt of my niece’s sorority T-shirts when she attended LMU. It was her graduation present from me and hubs. I loved reading this blog! Being with you two is always so much fun…I can only imagine what it must be like when the whole gang is gathered! I’m going to be teaching my daughter to quilt very soon. She wants to make her boyfriend a Crown Royal Bag quilt. I hope we still love each other after the last stitch of the binding is made!